A Life of Sugar and Spice: Not even apples are safe. THERE IS CASEIN ON MY APPLES. Thankfully organic apples do not have any synthetic coating, if they look or feel waxy, it's simply the natural wax produced by the apples themselves. Just another reason to go completely organic I guess! Boy was I blown away by this. We usually buy organic apples. Ontario apples are usually casein free. If Canadian labelling law goes through then bagged apples will have to lable milk but not loose apples. 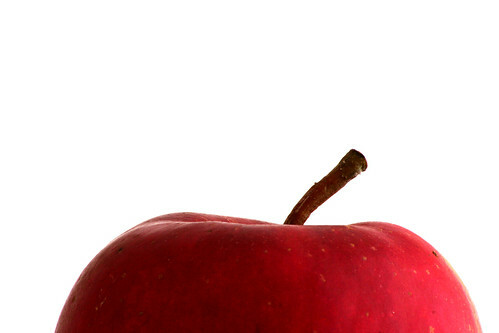 waxed apples can also contain corn or soy. Karen thanks for the info, I knew before that non-organic produce was probably loaded with pesticides and chemicals but now that I have this actual proof it really hits it home for me. So frustrating. Are you kidding me? I wonder if the wax can contain gluten...I always get rather nervous eating non-organic apple-skin, but I do it anyway in a rush. Gross! NO WAY! UGHHHHH. I actually avoid apples (unless peeled and cooked) because my tongue and mouth gets itchy (it happens to my sister too). OH geez! That explains so much. I too would sometimes react to apples, and other times they'd be fine. I thought it was pesticides or something, but this makes even more sense given I have a dairy allergy. MOST frustrating. I never even thought there might be milk on my apple!! !